Certified Information Systems Security Professional (CISSP) is an independent information security certification granted by the International Information System Security Certification Consortium. CISSP is a standardized, vendor-neutral certification program that provided structure and demonstrated competence relevant to information security professionals. Basic computer (system) architecture refers to the structure of a computer system and comprises its hardware, firmware, and software. The CompTIA A+ certification exam covers computer architecture in depth and is an excellent way to prepare for this portion of the CISSP examination. Hardware consists of the physical components in computer architecture. The main components of the computer architecture include the CPU, memory, and bus. • Arithmetic Logic Unit (ALU): Performs numerical calculations and comparative logic functions, such as ADD, SUBTRACT, DIVIDE, and MULTIPLY. 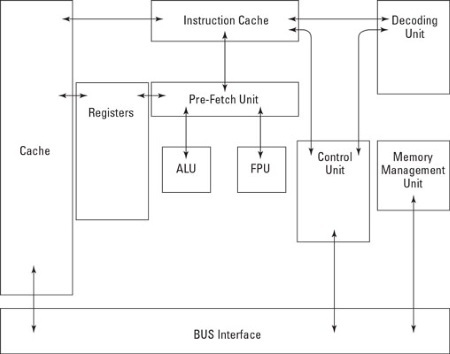 • Bus Interface Unit (BIU): Supervises data transfers over the bus system between the CPU and I/O devices. • Control Unit: Coordinates activities of the other CPU components during program execution. • Decode Unit: Converts incoming instructions into individual CPU commands. • Floating-Point Unit (FPU): Handles higher math operations for the ALU and control unit. • Memory Management Unit (MMU): Handles addressing and cataloging data that's stored in memory and translates logical addressing into physical addressing. • Pre-Fetch Unit: Preloads instructions into CPU registers. • Protection Test Unit (PTU): Monitors all CPU functions to ensure that they're properly executed. • Registers: Hold CPU data, addresses, and instructions temporarily, in special buffers. The main components of a CPU. • Data bus: Transmits data between the CPU, memory, and peripheral devices. • Address bus: Transmits addresses of data and instructions between the CPU and memory. • Control bus: Transmits control information (device status) between the CPU and other devices.